runmason.com was present at the Tuesday Spring signing in which 5 of our XC, or Track & Field athletes had their "official" signing to recognize their decision to compete at the college level. There were 22 senior athletes for the spring signing and a crowd of family, friends and teammates packed the school's Harvard room to witness the signings. Our team members that signed included: Eric Hauser (track, XC) , son of Michelle Wainscott. Eric will be attending the University of Cincinnati. Matt Kahl, (track, XC), son of Kim and Hank Kahl will be attending Kent State and running for the Golden Flashes. Matt Larcomb (Track, XC) was accompanied by his parents Ron & Vickie Larcomb. Matt will be running for the Norse of Northern Kentucky University. Dan Scurry (Track, XC), son of Doug Scurry will be joining Eric Hauser at UC and the two will be college roomates as well. Caleb Eastham (track) will be competing playing soccer for Cleveland State. In the fall, senior Chelsea Hoffmaster also signed. 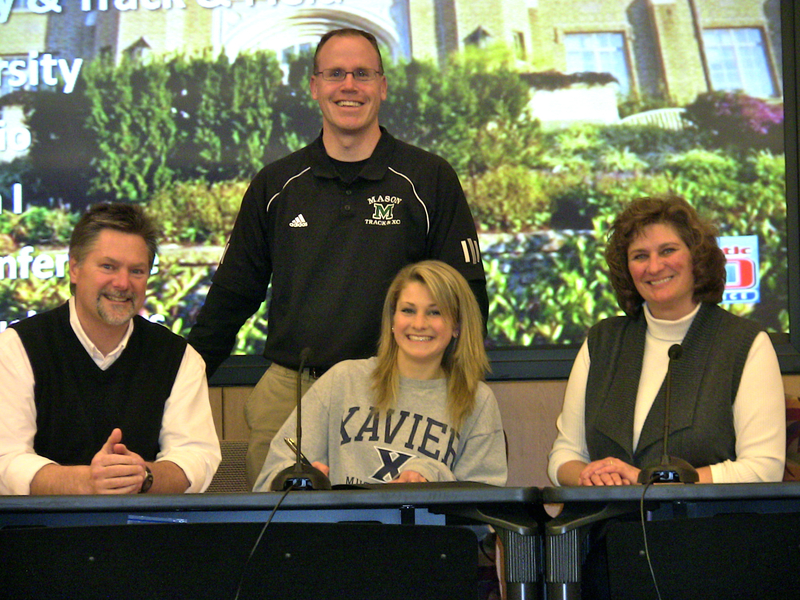 Chelsea will be running for Xavier University and she was accompanied by her parents at the fall signing. Congrats to all our senior graduates! The win by the Mason Men's and Women's Track & Field teams at Friday's conference meet enabled to the school to once again take home the All Sports trophy award. The Comets Track & Field teams immediately saw success entering the GMC with multiple first place finishes in the conference championship. Here are excerpts from the story by Mason's Dan Hilen of the AD department. The Comets are back in action this Wednesday and Friday for the District Championships. We are once again blessed to be able to host the District meet and not only allow our athletes to participate on their own home track but also more of our fans can attend to support the team. Come on out Wednesday and Friday and look for the parents in the special section near the finish line called "Comet Country". Go MASON! The coaches have a recap of both days of the GMC meet under the "COACH's BULLETIN" section of the website. After a season long batttle between Mason and Lakota West for the Greater Miami Conference's top honor, it all came down to the league track meet to determine which school would be this years All Sports Trophy Champion. As anticipated the Comet boys and girls track teams didn't disappoint, literally running away with GMC Championships and helping their school retain the coveted All Sports title for a third straight year. Mason and West have been 1-2 in the league rankings since the Comets entered the GMC in 2007. The boy's track team had a night to remember at Atrium Stadium setting four new school records while winning all four relays and earning individual titles in several races. The Comets also had a record setting night in the pole vault with Matt Mitchell and Wyatt Lowdermilk going 1-2 in the scoring. Mason's overall team total was 92 points better than 2nd place Middletown (176-84). "The evening was truly a team effort with nearly 20 Comets recieving GMC first, second or third team honors," said head track coach Chip Dobson. The deep and talented girl's track squad likewise showed they are the class of the GMC, outdistancing their nearest competitor, 2nd place Sycamore, by 80 points (170-90). The 4x800 and 4x100 relay teams were first place finishers. Individual titles were earned in the pole vault, 100 and 800-meter events. Mason finished 2nd in two other relays and 2nd in six individual races. Sarah Hunter broke the school record with a jump of 17’11’’. The Mason track teams will seek to repeat as District Champions when they host the event Wednesday and Friday. For more information and individual track results visit the GMC web site. Thanks to everyone that worked at the Mason Invite! Your help made the meet possible. This week is also a busy week. We have a need for a couple of volunteers on Wednesday. Video from the meet will be up soon so check out www.runmason.comand our youtube link that is found on the page. We will be hosting for the next two Wednesdays and Fridays. Please volunteer to help make this a success so we will get the meets again next year. These will be the most important meets we host all year so we need to do a really good job. We need help at the SHOT and DISCUS area on Wednesday for the GMC prelim. Please contact Tom Frye as soon as possible if you can fill in those spots this Wednesday To contact Tom: , H 459-9841 W 948-4642. Every year we collect money for a gift to show our appreciation. You can still participate by bringing your donation by the concession stand during any of the remaining meets, or you can mail it to our treasurer Theresa Honaker at 6307 Fireside Drive Mason, OH 45040. Make all checks payable to Mason Track, XC Boosters. If you took any pictures you would like to submit for the team video please contact Jean Martin for the girls and Kayla Wills for the boys. COMET ZONE & SOLE PURPOSE - TEAM UP! 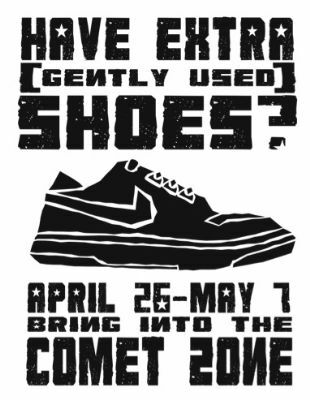 At this year’s Rod Russell Mason Invitational the Mason High School Spirit store, The Comet Zone, is teaming up with Mason Runner Zach Will’s organization, Sole Purpose, to give back and donate shoes. Sole Purpose is a non-profit organization that donates new to slightly worn running shoes to children in other countries that cannot afford them. If you want to help out, bring your shoes to the meet! The Comet Zone will be set up to take donations. Contact them for any questions at . Check out our pictures online and the videos that are at www.runmason.com and our youtube link athttp://www.youtube.com/user/RunMason . More videos were added this morning of the Wayne Invite. The Mason Comets really shined at the District meet on Saturday night. Thanks to all of you that volunteered and worked at the meet to make sure it was a success. Be sure to check out videos of the meet at our youtube channel. Next up for the Comets is the Regional Meet at Dayton's Welcome Stadium. Thanks to everyone for all their hard work the last 3 weeks - two nights a week for 3 weeks was a LOT of work! This clip features the Mason girls teams. Thanks to everyone that ordered Comet Gear this year! The orders are being processed now and we should expect delivery sometime around March 26th. All the items will be delivered to your runner at practice. Thanks so much for supporting the team! Mason men - Regional Champs for the first time in school history! This is the article from the Regional Meet that was in the Pulse Journal online. DAYTON — The Division I regional boys track and field team title came down to the wire. And it was the Mason Comets that claimed victory. Mason’s boys won the D-I team title by the slimmest of margins on Friday, May 28 -- beating Trotwood-Madison by a 73-72 score. The Comets held a three point lead going into the final event, the 1,600 meter relay. Trotwood won the race, but Mason’s Junior Mapati, Andrew Gaylan-Mann, Chris Lehman and Alex Hamm took second in three minutes, 19.01 seconds to preserve the win. 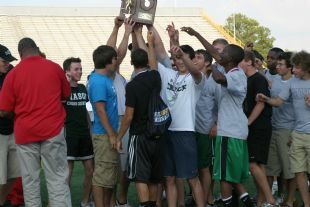 “We’re really excited,” Mason boys track and field coach Chip Dobson said. “These guys have worked so hard, some of them for four years, I couldn’t be more pleased. It was a team effort, guys stepped up all over the place. In addition to winning the team title, the Mason boys won two individual championships at Welcome Stadium. Zach Wills won the 3,200 meters — his third straight regional title — in 9:21.16. He also ran a leg on the winning 3,200 meter relay team — with Matt Kincaid, Tate Honaker and Matt Kahl — in 7:52.74. Also qualifying for next week’s state championships for the Mason boys were Matt Mitchell in the pole vault (2nd, 14 feet), Alex Hamm in the high jump (2nd, 6-5), Eric Hauser in the 3,200 meters (3rd, 9:26.46), Matt Kahl in the 1,600 meters (4th, 4:25.39), Taylor Celestin in the 110 meter hurdles (4th, 14.40) and the 800 meter relay team of Mapati, Hamm, Scott Strait and Caleb Eastham (3rd, 1:28.68). Mason’s girls placed third as a team with 53 points, behind champion Walnut Hills (63 points) and Withrow (59). Mason’s girls won the regional title in the 400 meter relay as Kera Lamotte, Sarah Hunter, Brittany Betts and Tiwa Akomolede finished first in 48.30 seconds. That same quartet also qualified in the 800 meter relay, placing third in 1:40.92. Also qualifying for state for the Mason girls were Olivia Bergesen in the pole vault (3rd, 10-9), Sarah Hunter in the long jump (3rd, 17-8 1/4), Brittany Betts in the 100 meters (3rd, 12.13 seconds), Jessica Harrison in the 3,200 meters (4th, 11:32.48) and the 3,200 meter relay team of Harrison, Monica Lake, Chelsea VanHook and Brenna Hallum (4th, 9:29.22). Contact this reporter at (513) 696-4526 or .